Anyone familiar with motorcycles could readily identify the iconic design of this 40 foot pool within seconds. 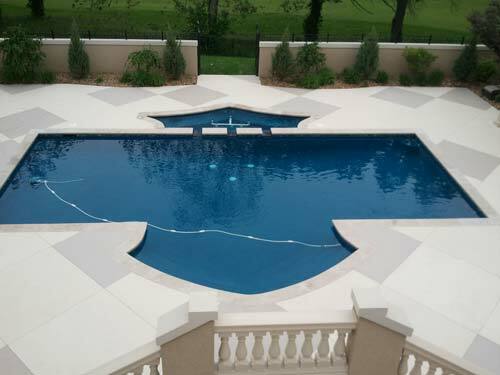 Located on an estate in Kansas City, Missouri, this unique pool had an older, cracked surround that needed to be updated. Willie Brownsberger and his team at Will’s Concrete Concepts of the Kansas City Area in Missouri took on the challenge of creating a modern look that still complimented the “classic” design on this concrete pool deck. Willie and his team, first, had to remove the old texture on the concrete pool deck, patch and repair the entire 4,000 square feet expanse around the pool. The cleaned and profiled the surface with SCR, a environmentally friendly 3-n-1 concrete surface prep solution. Once the surface was ready the team applied SureTex, a Knockdown Overlay by SureCrete, to the entire surface. (SureTex is a single component overlay that can be troweled or sprayed and forms a non-skid surface; it bonds well to both new and existing concrete surfaces.) A 4’x4’ square design was saw-cut into the newly overlaid surround. Finally, the four day project concluded with sealing. Willie chose SureCrete’s pigmented acrylic sealer that contains an acrylic resin to aid with water repellency, in three neutral shades that would blend with the house. Each square was individually coated with SureSeal in Antique White, Sun Buff, or Smoke to accomplish the desired pattern on the concrete pool deck.